Rinehart, Cobble Hill resident and violist with the New York Philharmonic, was a performing member of the group of eight crème de la crème performers that included the famous Kavafian sisters, Ani and Ida, as well as Erin Keefe and BCMS director Carmit Zori, on violins. Louise Williams was the second violist. On cellos were Edward Arron and Zvi Plesser. AS THE CONCERT BEGAN with Enescu’s florid, harmonic variations on Romanian folk tunes, the small platform stage in First Unitarian Chapel could barely contain the eight formidable musicians with instruments, music stands and elbow room. An enraptured audience had taken every available seat and many stalwart members of BCMS stood, leaning against the side walls of the chapel. The famous Ida Kavafian played first violin at the front edge of the stage, with her equally noted sister Ani two chairs away. For the Mendelssohn octet, with the wonderfully familiar, almost-galloping violin passages, it was Ani who played first violin. Audience members seated in the first few rows seemed unable to take their eyes off Ani, who literally rocked in her chair, feet off the floor, while her left-hand fingers made the neck seem like a dance floor where a whole chorus performed. While all eight musicians were in unison like champion athletes — an inspiring evening even for those unfamiliar with chamber music — it was the extraordinary virtuoso ensemble that devotees had come to hear. 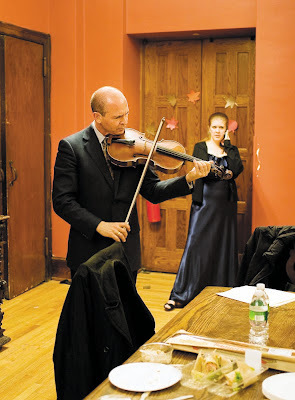 Supporters of the Brooklyn Chamber Music Society show clearly in their standing ovations, as well as their financial support, that they appreciate the years of training and dedication required to produce such an evening as was heard last Friday. COBBLE HILL RESIDENT CARMIT ZORI, artistic director of BCMS, must plan programs as far as a year in advance, as her guest performers are in such demand. 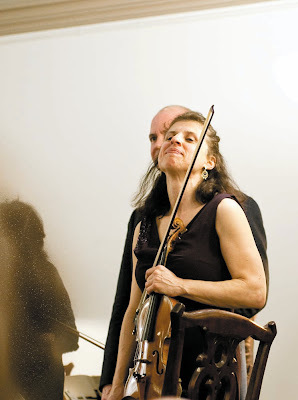 Coming up in March: an all-French music program. In April, it’s Mozart and a Schubert octet with outstanding wind players. Closing the season in May, an all-Bach program with seven visiting musicians. While Ms. Zori’s patrons and audience members come from all parts of Brooklyn, many fans in the Heights find it irresistible that they can walk to concerts. Seen among Friday’s full-house were noted Channel 13 star announcer TOM STEWART and cabaret performer MAUREEN KELLEY STEWART, founding board member of BCMS; JUDITH HAZEN and celebrated photographer BERNARD MINDICH, husband of violinist Ani Kafavian; ROBERT RODGERS, president of the Rembrandt Club, and ROBERT HEBRON, president of Ingram & Hebron real estate. Heights patrons often seen at concerts include SETH FAISON, former chairman of the Brooklyn Academy of Music, credited with bringing Harvey Lichtenstein to BAM; preservation expert OTIS PEARSALL, who, along with wife NANCY, is honored often for having created the Brooklyn Heights Landmark District; and former Jets Super Bowl star JOHN DOCKERY.